The summer months have begun, and while this means enjoying the warmth, the beaches, and the cool treats, it also means that we need to be wary of the ill effects of too much sun. Very often people tend to overlook the dangers that lurk around the corner during the hot weather. These hazards are particularly risky for older adults and young children. Eye Damage – Exposure to too much sun without any protective gear to save your eyes can cause a great deal of damage which includes a higher chance of getting cataracts and macular degeneration. Protect your eyes by wearing UVA and UVB resistant eyeglasses especially when you are out and about. Sunburn Even On A Cloudy Day – Putting on sunscreen when it is sunny outside is a great idea, but you need to ensure that you are slathering it on even when it is cloudy. As much as 80% of the sun’s ultraviolet emissions can penetrate through a cloud cover which makes it vital to protect your skin even on overcast days. Heart Troubles – Exposure to too much heat can overburden your heart. The human body responds to excess heat by sweating which brings down the blood pressure making the heart pump faster. People on medications for heart ailments may find their condition worsening when it is too hot. It is important for such people to stay hydrated and fresh. Air conditioner Mold – Air conditioner filters can be a cesspool of allergens like mold, dust and particulate matter that can make life very difficult for those with respiratory ailments. It is, therefore, necessary to clean these filters at least once in 2 weeks and change them after three months of use. Urinary Tract Infection (UTI) – It is very crucial to stay hydrated during the summer. 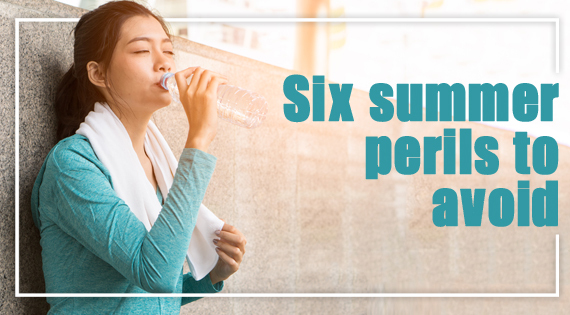 Excessive heat-related dehydration can lead to a growth of bacteria that cause urinary tract infections. Food-borne diseases – Illnesses that stem from undercooked or spoiled food are always at an all-time high during the summer. To avoid infections, make sure that you wash your hands and cooking surfaces thoroughly and often. Also, try to steer clear of rare meat especially at restaurants and ensure that your salad greens and fruits are appropriately washed before consuming.